We have certainly come a long way when it comes to empowering mobility-challenged people, which includes the wheel-chair bound, paraplegics and the elderly. Indeed, modern technology has provided new ways in which the physically handicapped can lead lives less encumbered by their limitations. And in the case of handicap-accessible vehicles, there have been some significant improvements in the last decade. Through the years, we have seen numerous types of handicapped cars, wheelchair transportation vans and wheelchair conversion vans. They usually come with all kinds of modifications, depending on the user’s specific needs. Learn more about the disabled vehicle equipment available to the everyday user. 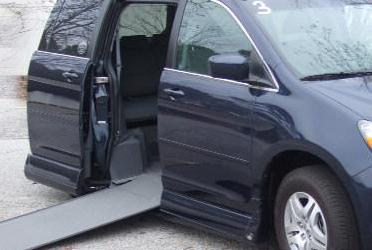 Handicap equipped vans can be generally classified into three types. The first type is what we call the Up Front type. This is a type of handicap van that allows front seat entry for the disabled. This allows the disabled person to occupy the vehicle’s front seat, just beside the driver. The second is the Rear Access type. As its name implies, this kind of vehicle allows the disabled person to occupy the back or rear end of the vehicle. Cars of this type usually feature a bigger space in the rear area to allow easy entry and exit. The third is the Independent or Drive From type, which is specially designed to allow the handicapped to drive the vehicle themselves. Naturally, since it is designed to give more freedom, this kind usually features more elaborate customizations. For instance, some models feature wheelchair lift capabilities. A few even have easy-to-use permanent (or portable) hand controls. Traditional foot controls may be replaced with specialized switch systems or joysticks. Popular auto manufacturers like General Motors, Chrysler, Ford, Honda, Chevrolet and Toyota have already introduced handicap-accessible vans in selected markets. There are also companies that specialize in modifying your current van or minivan into a handicap van conversion. For those whose preferences are not limited to handicap vans, they can choose another car model and have it converted. There are plenty of vehicle conversion shops that are widely available in the US and in the UK. These shops can convert pick-up trucks, SUVs and other multi-purpose vehicles. Depending on the extent of the conversion, it may take a month or a few weeks. It is always best to discuss the specific needs with the conversion shop in order to get maximum results. When converting a regular van into a wheelchair accessible vehicle, there are other factors to consider such as the height of the van, the shocks, the rails and whether or not you want a wheelchair ramp or a wheelchair lift. You can also decide on side entry or rear entry installations. The difference in entry is important when you are parked in a cramp non-accessible area because the the ramps might not be able to fold out. This is less important in handicapped vans with wheelchair van lifts. If you can not afford the costs, renting handicapped equipped vehicles are also another option. One can find many organizations in the US and Europe that offer handicapped-friendly vehicles that can be leased for a specific duration of time. Some of these organizations even offer repair services, reconditioning and maintenance for these kinds of vehicles. Of course, with all these diverse choices of vehicles for the mobility-challenged, the key is to choose which car works best for the handicapped person. Naturally, costs should be considered before buying one as well as the cost of maintenance for that vehicle. But the most important factors are the ones that directly involve the experience of the disabled. In order to get the best handicap vans and vehicles, make sure to ask yourself these questions. How easy is it to operate the car? How user-friendly is the car? Ease of entry and exit should be considered. With wheelchair users, space is essential. And depending on the climate, ventilation systems must be properly in place, too. Chairs should be structurally secure while other fixtures and accessories mustn’t hinder the person’s movement. So before considering the best cars built for paraplegics, disabled, wheelchair bound, elderly or mobility challenged, make sure there are no viable alternatives. It could end up saving you a lot of money and hassle.